It’s a great story: a business owner finding success with a hobby they love. But look closer. This tale has much more to offer. 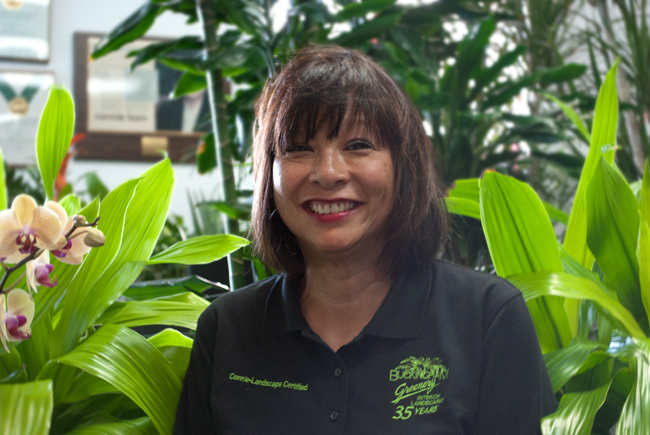 Connie Hom’s business, Buckingham Greenery, has an employee retention rate that is unbelievably high (over 90 percent) in an industry with an employee base that can be, for the most part, transient and seasonal. And its CEO? She’s still keeping a promise she made to herself more than 35 years ago – and following a passion that’s about much more than delivering pretty plants. Here’s the story of the amazing, blossoming ecosystem that is Buckingham Greenery, Inc. It might not be surprising to hear that Hom always had an affinity for plants (she grew up on a farm in New Jersey). What might be surprising to some is that she describes her level of horticultural literacy as “hobby knowledge.” Instead, her passion centers around the environmental impact plants offer. “Everyone loves plants because they’re pretty, but I’m most passionate about what plants do,” she says. Hom founded Buckingham Greenery in 1982 in Buckingham, Virginia, and for the past 35 years, she has brightened the interiors of some of Richmond and Central Virginia’s most prominent commercial spaces and adorned countless hospital waiting rooms, small business offices, universities and mall courtyards with her work. From Fortune 500 companies to regional healthcare facilities to national retail chains, her business’ portfolio is as complete as it is diverse. It’s also a business that has survived three recessions. Today, the company employs approximately 25 people and has satellite facilities in Richmond, Charlottesville and Norfolk that serve Richmond, Fredericksburg, Chesterfield, Colonial Heights, Petersburg, Norfolk, Virginia Beach, Williamsburg (all of Tidewater), Charlottesville, Harrisonburg, Staunton, Lynchburg, Roanoke, Christiansburg, Blacksburg and, of course, Buckingham. 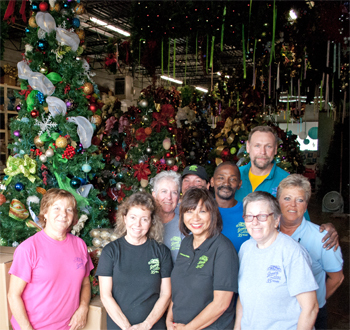 We recently caught up with Connie at her Richmond location, which is Buckingham Greenery’s “Christmas Headquarters,” and it’s abuzz with activity. Holiday music plays in the warehouse, which, at the moment, is a holiday forest of nearly 100 fully decorated trees. Enormous wreaths hang from the rafters; ornaments, ribbons and holiday displays abound; and champagne reindeer adorned with rhinestones watch on, awaiting their turn for delivery. The space exudes creativity and fun, and we were introduced to each and every employee. Hom is far from complacent these days. “I want everything!” she tells us. And she’s on her way to getting it. More inorganic growth by way of acquisition is in the near plans for Buckingham Greenery. We couldn’t be happier for her. Happy 35th anniversary, Connie Hom and Buckingham Greenery! Find someone to supplement an area of weakness for you as the CEO. Over the years, Buckingham Greenery has broadened its market base: an important reason why the business has survived three recessions. If you need to be well staffed for a certain business cycle or time of year, factor in time for the learning curve. Thank you for sharing. Very interesting to meet Connie and learn more about her work! Great leader for a great business!